wwwhatever uses the tried, tested and very successful WooCommerce plugin for online sales. 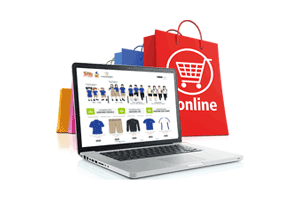 WooCommerce is an eCommerce platform built on WordPress® and it is regularly audited by Sucuri , an industry online security leader. The modular design allows you to sell anything, from physical products to digital downloads. No matter the size of your store, whether you are selling only a half-dozen products or selling thousands, WooCommerce will scale to meet your requirements. You can offer free shipping, flat rate shipping, or make real-time calculations. You can limit your shipments to specific countries or open your store up to the world. WooCommerce can accept major credit cards, PayPal™, BACS™ (bank transfers), and cash on delivery. There are also additional options with more than 140 region-specific gateways including popular choices like Stripe™, Authorize.Net™ and Amazon Payments™. Yes, it is, until you get used to it. wwwhatever will help you set up your first store and also provide you with a ‘How to …’ booklet so you can maintain your store yourself. Alternatively, we will keep your store updated for you for an ongoing monthly fee. We don’t want to spook you because you’ll find WooCommerce easy to use and most suitable. The problem won’t be with the software, it’ll be the photos you need to take to show off your products. If your supplier(s) cannot provide you with images, you will need to build yourself a photo booth so you can take high quality images of the products you are to sell. We also advise that you size each image using image manipulation software, such as Adobe® Photoshop®, so the images will download quickly. Your potential customers will expect to look at images before they buy and the more they can see the more likely they will be to buy from you than someone else. To explain the potential problem, as an example, each photo taken on an 8MP iPhone 6 camera takes up 5.22Mb of storage. According to Ofcom , the average mobile broadband download speed across all the networks on 4G is 15.1Mb per second and for 3G is 6.1Mb per second. So, depending upon where you are and what network you’re on, each 5.22Mb image should take less than half a second to download on a 4G network and one second on a 3G network. Multiply this by the number of images you have on the page and the time taken to download all the images can add up. Later, higher resolution cameras on more recent phones will require even more storage, making download times, potentially, even longer. You don’t need such large images in your store so we advise that you reduce the size of the image to reduce the download time. Delays in downloading may irritate your potential customer causing them to leave your website and look elsewhere.